Endoscopy describes many procedures that look inside the body using some type of endoscope, a flexible tube with a small TV camera and a light on one end and an eyepiece on the other. The endoscope allows doctors to examine the inside of certain tubelike structures in the body. 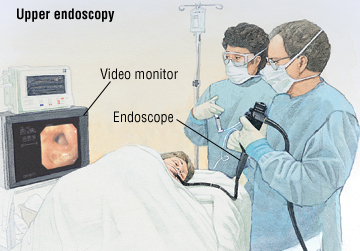 Many endoscopes transmit the doctor's view to a video screen. Most endoscopes have attachments that permit doctors to take fluid or tissue samples for laboratory testing. Upper endoscopy allows a doctor to see inside the esophagus, stomach and top parts of the small intestine. Bronchoscopy examines the large airways inside the lungs (bronchi). Sigmoidoscopy and colonoscopy examine different parts of the lower digestive tract. Each type of endoscopy uses a slightly different endoscope with a different name — an upper endoscope for upper endoscopy, a bronchoscope for bronchoscopy, a sigmoidoscope for sigmoidoscopy and a colonoscope for colonoscopy. Other endoscopes allow doctors to see inside the abdomen and inside joints through small incisions.